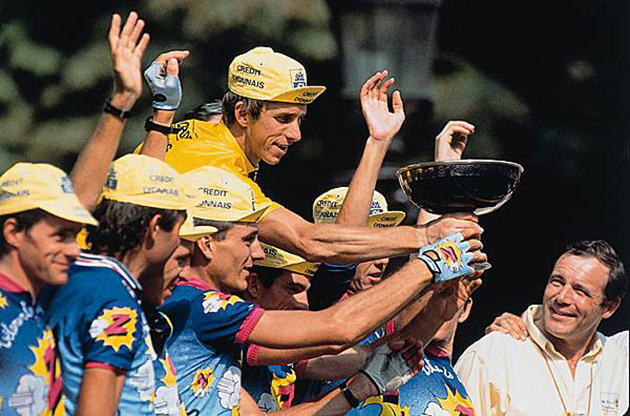 California native Greg LeMond won his first of three Tours de France in 1986, a breakout year for American cycling. Team 7-Eleven took the leader's yellow jersey in their debut, when Canadian Alex Stieda broke away on a short, 53-mile stage to claim every jersey on offer. LeMond see-sawed his way to the top step of the podium in France, battling his La Vie Claire teammate Bernard Hinault, becoming the first (and only) American to win the sport's most coveted prize. Many people don't know that Greg's father Bob, a successful Nevada realtor, took up the sport with his 15-year-old son in the mid `70s, quickly moving up the amateur ranks after shedding weight and his smoking habit. One of Paved‘s favorite riders, Lindsay Crawford, remembers meeting the LeMonds early in their careers. "If I recall, Greg and Bob were out riding from their home on Franktown Road in Carson City, Nevada during the Northern California district championships on the same course in 1975, and were inspired by seeing a bike race," Crawford said. "Once we became friends, about a year later, Greg and Bob would stay with my family in Woodside, California if there was a race in the area. They had a VW camper and insisted on sleeping in it rather than inside the house." According to Crawford, there was a famous interview on a Reno station when it was becoming obvious Greg was destined to greater heights. "He was questioned about how hard it was to climb to the Mt. Rose summit and he said it was always hard but, as he improved, he just got to the top in less time! That’s a 16-mile climb, gaining about 4,500 feet, topping at just over 9,000 feet. I’ve ridden it many times." 1. Young Greg was hooked on the new sport of mogul freestyle skiing, and for his 14th birthday was sent to up to Wayne Wong’s ski camp. Coaches there said bike riding was ideal to get in shape for skiing. LeMond bought a road bike at Rick’s Bike Shop in Reno, and a guy named Cliff Young, a racer in Northern California, invited the teenager to a Reno Wheelmen Club meeting. Two weeks later LeMond showed up in tennis shoes, tank top and running shorts, with his 35-pound bike in the middle of the Reno winter. "Everybody else had their leg warmers on, with Italian bikes," he said in a 2007 interview. "I ended up getting second place. It was a 28-mile race, four laps around a 7-mile loop right in front of my house. "They convinced my dad that I must have some special talent. So my dad got me a new bike, a Cinelli at Rick’s Bike Shop. I got the shoes, the shorts. Two weeks later I started my first race in Sacramento and won my first 11 races…" Bob LeMond became teammates with Crawford and cyclocross legend Danny Nall on the GS Strada team in 1978 and `79. For a short period, Greg was also on GS Strada as an honorary member, although officially he was on the Renault-Elf professional team with Hinault in France. 2. Nevada framebuilder Roland Della Santa was an early influence on both LeMonds. Della Santa, himself a former road racer, had an extensive collection of European cycling magazines and Greg would spend hours at Roland’s house pouring over race reports to understand how the Euro races transpired, learning about tactics, training, etc. 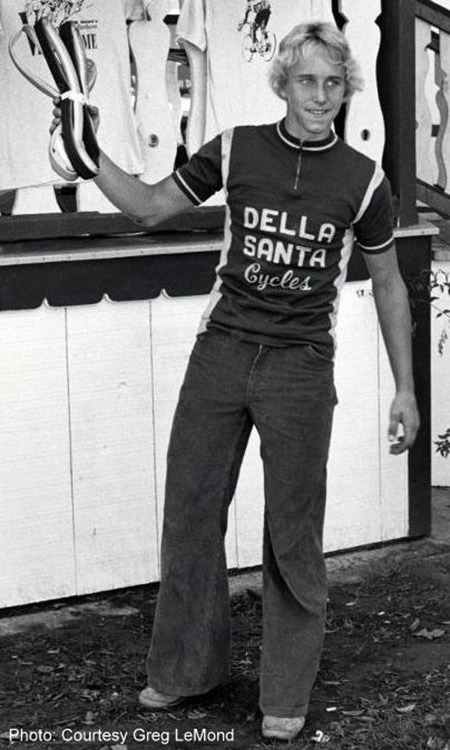 LeMond would race on Della Santa's custom steel bicycles for many years, bearing the names of his official bike sponsors to please top brass. 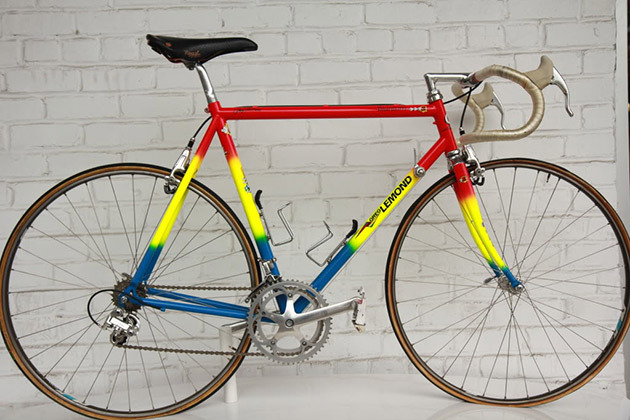 TVT (Time), Calfee and Merlin would also build custom bikes for Greg, with the LeMond logo running on the down tube. LeMond is the last Tour champion to race bikes bearing his name. “At Greg's request, I designed and Merlin built the Team Z Titanium frames for the '91 season. The team paid Merlin and me for the work we did, a very unusual turn of events in the pro world. That was 11 months before the first butted titanium frames were made (March of '92). 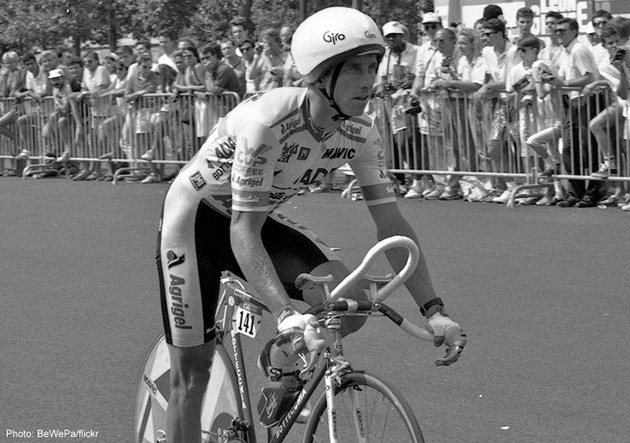 At the end of the '91 season, which was not very good for Greg, his company, through his father, approached Merlin in an attempt to find a supplier of titanium frames that could be marketed under the LeMond name. At that time, Merlin was working on what would eventually become the Extralight. Merlin offered LeMond Cycles the exclusive rights to the Extralight for five years but Merlin was turned down because of the price. That was the end of any talks between LeMond Cycles and Merlin. In the end, it worked out beautifully for Merlin since the Extralight became the state of the art for racing frames by mid '92 and remained there for some years. For at least a year after that LeMond Titanium frames were made by Sandvik. 3. While he was the reigning Junior World Road Champion in 1980, LeMond received no offers from pro teams, and in the spring, he joined the U.S. National cycling team for a 6-week European racing campaign. There, he finished third overall in the Circuit des Ardennes before winning the 1980 Circuit de la Sarthe stage race in France, becoming the first American and youngest rider of any nationality in the history of the sport to win a major pro-am cycling event in Europe. After he returned to the U.S., LeMond won the 1980 Nevada City Classic, considered to be one of the most historic and challenging professional cycling races in America. Despite eventually receiving several other offers to turn professional besides Cyrille Guimard’s, LeMond did not consider them seriously, and he signed with Renault-Elf in Paris on the day the 1980 Tour de France finished; he was 19. LeMond hitched his wagon to the man responsible for taking Hinault, Fignon and Lucien Van Impe to the top step of the Tour podium, and who himself raced in the era of Eddy Merckx. Guimard was a sprinter who won nearly 100 races in eight seasons. 4. On August 27, 1989, LeMond won the 259km World Championship road race in Chambéry, France, defeating Fignon again and edging Dimitri Konyshev and Sean Kelly on the line. Fignon attacked incessantly in the wet, treacherous final climb, but LeMond and a select group caught his rival and then LeMond made the perfect sprint to take the title. Fignon finished 6th. LeMond was only the fifth person in history to win both the Tour de France and the World Championship in the same year. In December, Sports Illustrated magazine named LeMond its 1989 “Sportsman of the Year”, the first time a cyclist received the honor. 5. LeMond finished third in his debut Tour of 1984, wearing the rainbow jersey of world champion while racing for Renault-Elf in support of winner and teammate Laurent Fignon. The Frenchman would prove to be LeMond's nemesis in the historic 1989 Tour, which came down to the final time trial into Paris. Fignon was in yellow by 50 seconds over LeMond, who used every technological advantage he could muster (aero clip-on bars, tear-drop helmet, Oakley shades, aerodynamic funny bike, one-piece skin suit, rear disk wheel) to usurp Fignon by 58 seconds, taking the general classification by a mere eight seconds. LeMond’s 54.545 km/h average speed for the stage 21 time trial was the fastest ever ridden in Tour history until Dave Zabriskie crushed it in 2005. LeMond would win his third and final Tour in 1990 riding for Team Z, without winning a stage; weeks later he won his first of two Chequamegon 40 mountain bike races in the northwoods of Wisconsin. In the days before the event he caught a world-class line record bass in Lake Owen that was registered in Hayward's National Fresh Water Fishing Hall of Fame.